On June 13, 2000, the leaders of North and South Korea met for the first time since the nation split more than 50 years earlier. This sculpture stands on the South Korean side of the demilitarized zone (DMZ) between South Korea and North Korea. The two nations share a united history and culture, but have been politically divided since 1945. South Korea is democratic and capitalist, while North Korea is an authoritarian, communist government. 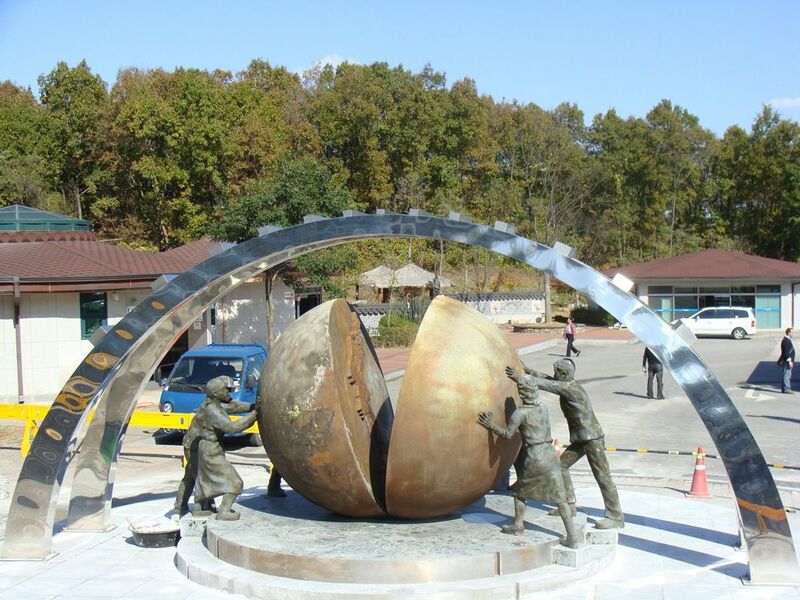 This sculpture represents the hope of many Koreans that the two nations will someday reunify. On June 13, 2000, the leaders of North and South Korea met for the first time since the nation split more than 50 years earlier. Since 2000, there have been only two other inter-Korea summits, in 2007 and 2018. The first inter-Korea summit is largely regarded as a success of South Korean President Kim Dae Jung’s “Sunshine Policy” toward the north. The Sunshine Policy created more open diplomatic relations, and Kim was awarded the 2000 Nobel Peace Prize for his work. Tension between the Koreas has increased since the political collapse of the Sunshine Policy. Topics for future inter-Korea summits may include the development of nuclear weapons by North Korea or policing the demilitarized zone (DMZ) on the border between the two nations. having to do with citizenship or public service. area not controlled by any government, and where it is illegal to station troops. the formal ties between nations. risky undertaking, especially a business investment.